While augmented reality apps have been positioned as the "new hotness" on smartphones for a while now, there have been very few games that blend all of the requisite parts of the technology to make something fun. 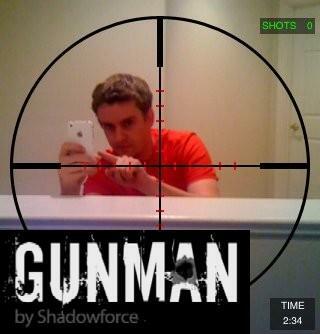 Shadowforce seems to be onto something with its new app Gunman (iTunes link), however. Described as "laser tag meets urban paintball" the game is played by pointing the iPhone's camera at opponents and 'shooting' them through the simulated scope. The game features a number of different game modes (Wi-Fi required for multiplayer) and works its magic by recognizing the colors that other players are wearing. The game is free on the App Store right now, so snap it up while you can.